The Bulle US Tricolour boonie hat is made of genuine issue MIL-C-3924J Quarpel treated American cloth which is lightweight, wrinkle resistant, machine washable, ripstop. Quarpel treatment is a water repellent finish designed for military use. 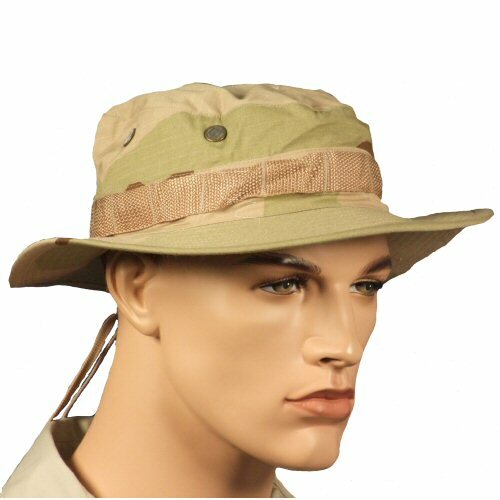 The boonie hat is patterned on the classic, US Army boonie hat shape, with wide brim, ventilation holes right and left and a band of webbing around the sweatband for addition of camouflage material. 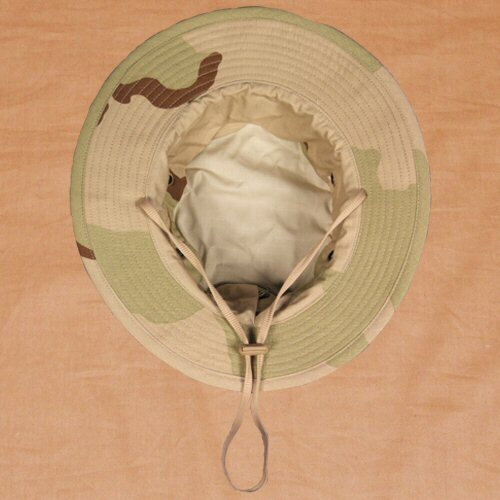 The hat is fitted with a stretchable chinstrap which adjusts to fit with a plastic shock cord toggle. The stretchable chinstrap allows for better movement without having to readjust the chinstrap. The hat matches with the Bulle US Tricolour BDU uniforms in Quarpel treated NYCO. Sizes available are: Small (56cm or 7 in), Medium (58cm or 7 1/4in), Large (60cm or 7 1/2in), XLarge (62cm or 7 3/4in), XXLarge (64cm or 8in). View of interior of hat showing the brim, interior and stretchable chinstrap with plastic toggle. The crown is unlined for better airflow.